Are you a Serral fan? Are you a Maru fan? Well, good news then, because you just won liquibets… This particular season of liquibets was like none that we had ever seen before. Up until now, the safest bet was to always vote for the Korean player, if they ever went up against a foreigner. Of course, there have been exceptions in the past. Players like Neeb, SpeCial, Scarlett, uThermal, etc. etc. were players that you could not afford to underestimate. They were more than capable of handling their own against Korean players, so it was always a heads or tails situation for LB votes. However, everything changed when Joona Sotala decided that he was no longer going to be “just another foreigner”. Serral is a frickin beast. He is a monster who devours his prey. He is a StarCraft deity who is changing the course of history as we know it. He is the first player ever to win a GSL tournament in South Korea, the first player ever to win 4 WCS championships in a single year, and the first player ever to win the WCS Global Finals as a non-Korean. There is no denying it now. Serral is the best SC2 player in the world. And the only way to win liquibets for this season was to never stop believing that he could do what no other player has ever done before. With that being said however, there is one more player that deserves the spotlight just as much as Serral does. Has anyone EVER won all 3 GSLs in a single year before? Nope. Or rather, that was true until Maru came along. When the time to step foot on the GSL finals stage arrived, Maru stretched out his arms and legs, cracked his neck, looked over towards former KT players Stats, Zest, and TY, smirked, and waved them over to come at him. With fire and determination in their eyes, they ran over to maru and threw everything they had at him. Unfortunately, the Jin Air ace was having none of it. With a merciless aura surrounding him, Maru lifted the GSL Champion trophy three separate times and reduced his opponents into dust during the process. It amazes me to see that we have yet another season of LB where two players tied for 1st place. Liquibets is such an unforgiving tournament. And yet, we have 2 champions again?! Good God… These people are absolute beasts Oo;; They never gave up and kept voting until the very end. Now, it is time to reward our winners for all their hard work and effort. So without further ado, CONGRATULATIONS to JudeauTV and EndlessViolence!!! Thank you very much to everyone who participated for Season 19. Season 20 will be starting soon, so get those votes in people! Excellent recap for an exceptionally excellent year of SC2. Iight the nightmare is over, time to recover my crown. Congrats to both. I'm ranked 109th? I can dig it. There will be best games of the year. uThermal was the only WCS player to beat Serral (in the qualifiers for one of the first WCS events this year), Serral beat everyone else, therefore uThermal player of the year. 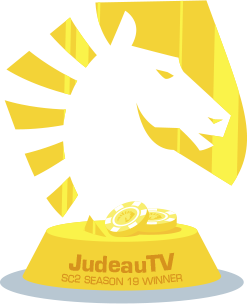 Thank you very much to TeamLiquid for managing Liquibet and for the write-up. Thank you to all my fans. Please keep cheering for me. I will try to show good bets next season, too. People thinking they knew exactly what they want, most of the time have no idea what they can get.